In working on the photos I had taken when I was nine years old, I had some real challenges trying to restore them. After all, it's been almost fifty years; for much of that time I had no idea how to store negatives safely and when I did learn, it was too late—they'd already been scratched. Add to that the fact that even black-and-white negatives deteriorate with age, and you can see that I would be lucky if I could even make out some of the images. Here's a photo for example. 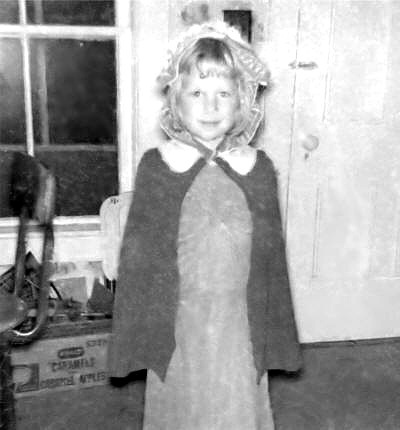 This is a picture of my sister, Louise, playing "dress-up" in one of Mom's old outfits. This picture had an interesting history. When I had the original film processed, no print was made of this negative, probably because it was overexposed. It was five years or so before I discovered the negative, its image so faint I could barely make it out. I had the print made. The drug store did the best they could. The negative itself has since been lost. The print spent a few years glued into an album, where it got even more badly scratched. The image above is the original scan of the photo, scratches and all. After cropping off the unnecessary edges, the next step was to try and remove as many scratches as I could. I used Microsoft PhotoDraw's Scratch tool to do this. It's a manual, tedious process when there are a lot of scratches; I probably spent twenty minutes on this step. Next I used Microsoft PhotoDraw's Dust Removal tool to get rid of as many little spots as possible. I blew the image up to 400% to do this. That left, in addition to the image, a number of minor scratches as well as excessive film grain, due to the picture's having been underexposed to begin with. In digital terms, this is called "noise" and I have a program called Neat Image, which is free in its demo form, which does an outstanding job of this. That gave me the image on the left. If you compare the two, you'll see the lower photo is much "smoother". The grain is gone, as well as most of the scratches. A few big blotches remain, however, especially on the door. Areas of the window that should be clear are also marred. It would probably have been possible to attack each blotch individually. But I don't have that much patience. So instead, back in Microsoft PhotoDraw, I used the Cut Out tool to make copies of each door and window panel. I then made those copies blurry (using the Blur/Sharpen tool) and pasted them on top of their original locations.That gave me this final version. Of course, this still isn't "perfect", but it's as good as it's going to get without enough effort to experience diminishing returns. And in terms of picture quality, I think it holds up well in comparison to other candid snapshots taken by nine-year-olds of the era. Besides, its main purpose is to remind my sister and I and our families how cute she was when she was seven and, without the distraction of the scratches and grain, I think it now serves that purpose.